Brownie Uniform. This uniform is worn by girls in second and third grade. The Brownie Uniform of today features a brown skirt and blue blouse. The tie is white twill. Girls have a choice between a vest or sash for their insignia. 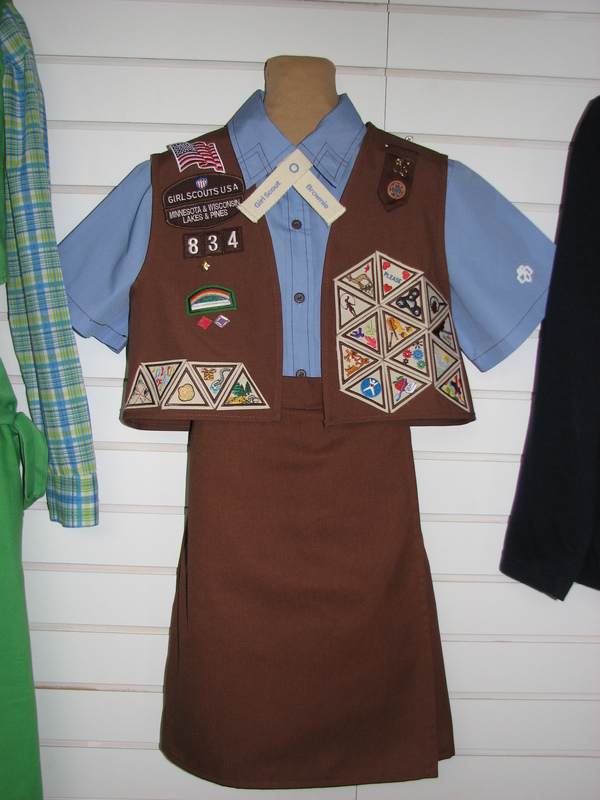 Uniform on loan from Girl Scouts of Minnesota and Wisconsin Lakes and Pines Council. Vest on loan from Sarah Jutten. This entry was posted in Collection Notes, Museum updates and tagged 100th anniversary, 1970s, 1980s, Brownie scouts, Brownie-girl-scouts, Girl Scout, Girl Scout Uniforms, Glenwood Girl Scouts, Pope County Museum, Vintage Girl Scout Uniform. Bookmark the permalink.